A few weeks ago, WMP reported how victims of Farid Fata, an evil Doctor who falsely diagnosed hundreds of patients with cancer so he could cash in, were ignored for years by the Department of Licensing and Regulatory Affairs (LARA) as well as Attorney General Schuette. 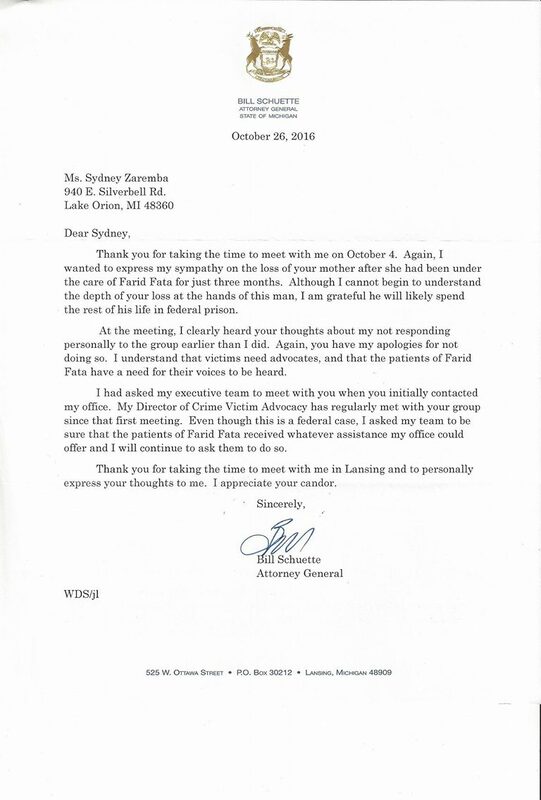 Since that report, WMP has obtained a letter to a victim from Schuette in which he apologizes for ignoring Fata's victims. I always give credit where it's due, and this case is no different. When is the last time Bill Schuette apologized to anyone about anything? (Or most other politicians for that matter?) There were no cameras, no media-they continue to remain silent about the story. No one is perfect, Schuette dropped the ball and he admitted it, that deserves kudos. Schuette wrote Sydney Zaremba of Lake Orion in October 2016. Zaremba's mother was killed by Fata's phony diagnosis. "I clearly heard your thoughts about my not responding personally to the group earlier than I did," Schuette said. "Again, you have my apologies for not doing so. I understand that victims need advocates, and the patients of Farid Fata have a need for their voices to be heard." 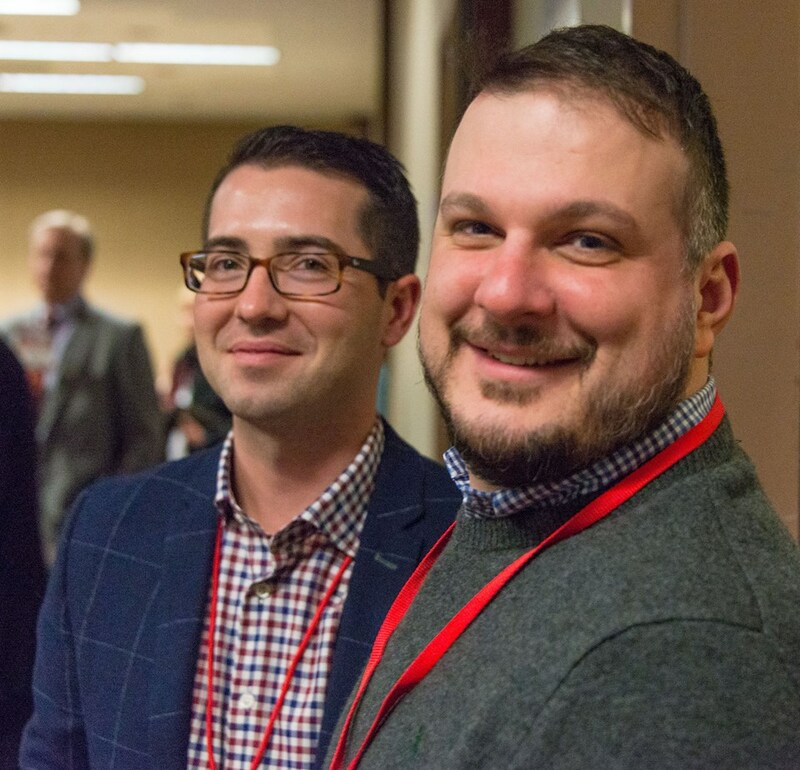 Matt Maddock is on the verge of raising over $100,000 for his State House campaign. Maddock's wife Meshawn made the announcement in a recent Facebook statement, saying her husband has raised $85,000 with more on the way. That's bad news for Liz Fessler Smith if she is thinking about getting in the race. Smith, a controversial figure in the area, recently came under fire for attending a school meeting in Waterford about bullying and was apparently collecting data from attendees, which many found extremely distasteful-especially if she plans to use it for political purposes. She is rumored to be considering jumping in. 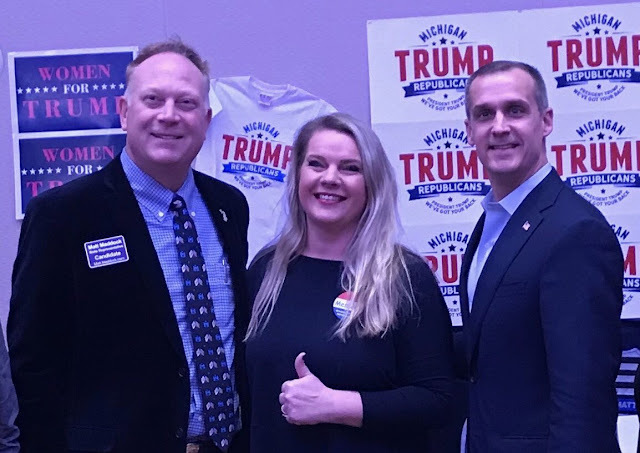 Maddock, a small business owner, has been involved in leading many well known grassroots groups, including Michigan Trump Republicans, Michigan Conservative Coalition, and the 11th Congressional District Majority Committee. He also helped organize Battlecry, the biggest annual conservative conference in Michigan. 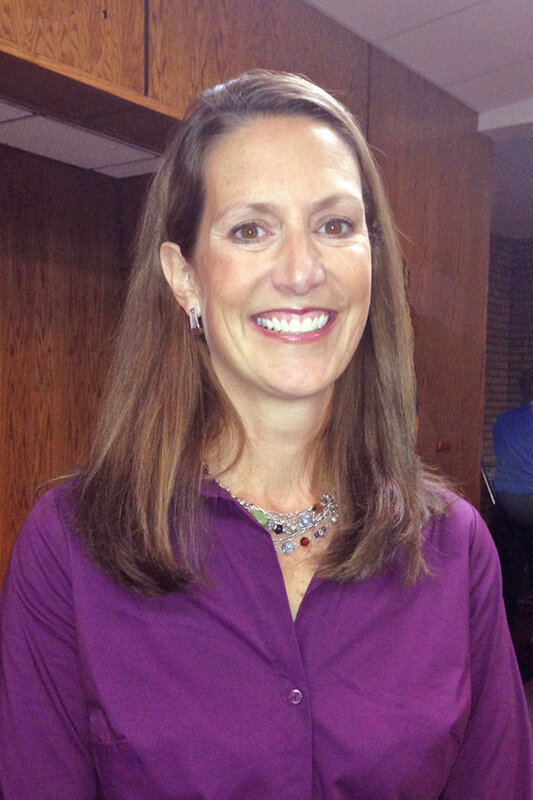 Maddock hopes to replace Jim Runestad, who is running for State Senate. Maddock has raised more than any non-incumbent running for State House, a fact that leaves the Lansing status quo and their lobbyists trembling. They'll have to spend serious money to sink Maddock, especially with his reputation for hitting doors. In a shocking new Mitchell Research & Communications poll, Bob Carr has surpassed John James for 2nd place in the Republican US Senate primary. Sandy Pensler, a metro Detroit businessman who specializes in saving failing companies, continues to lead the field with 16%. Bob Carr is 2nd with 11%. Carr's website describes his background as "Community Development and Historic Preservation." Carr won a major upset Congressional primary victory in the 90's in MI-1. Veteran and businessman John James has moved to 3rd with 8%. Polls are only a snapshot, and it's only March, but the low number for James is mind boggling for many reasons. Over 60% of voters are undecided. Senator Debbie Stabenow is under fire after she recently booted a conservative watchdog peacefully filming her remarks at a recent event. Stabenow was discussing prescription drug policies, leading one to wonder, what is she hiding? Why is she scared of her comments being public? The Michigan Republican Party blasted Stabenow in a statement about the incident. "(T)oday, United States Senator Debbie Stabenow had a tracker for the independent watchdog group ‘America Rising’ forcibly removed from a public press conference she was holding at Henry Ford Hospital in Detroit. The tracker was not asking questions or causing a disturbance. He was simply attempting to film the Senator’s remarks on prescription drugs. The event was open to the general public and he was thrown out simply for working for a group that the Senator does not like." Michigan Republican Party Deputy Chief of Staff Sarah Anderson says Stabenow crossed the line and should apologize. Don't hold your breath waiting for that apology! 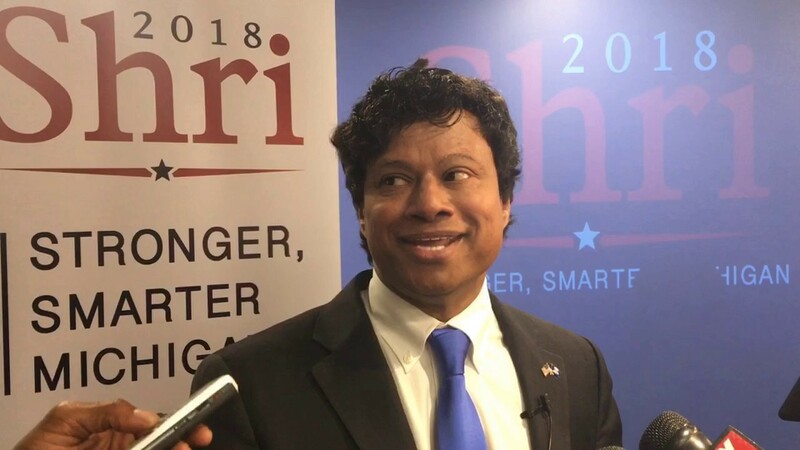 Shri Thanedar leads Gretchen Whitmer by 3% in a new MRG poll, and in a sign of Shri's growing momentum, he is already under fire from opponents. The political newcomer is handling the attacks like a pro. That's how Shri answered recent criticism over a donation he made to John McCain in 2008. In the latest poll of the race, Shri leads by 3, and is destroying Whitmer in Detroit. 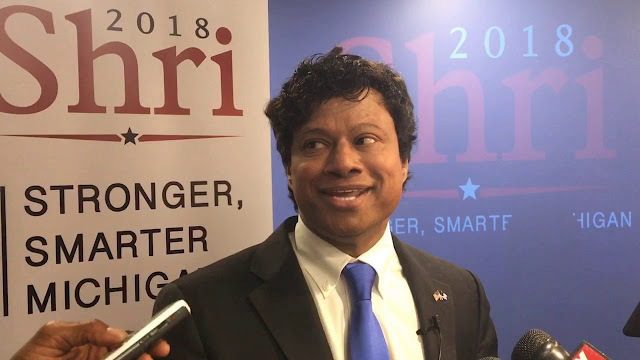 "A new Marketing Research Group poll finds progressive candidate Shri Thanedar holding a 3-percentage point lead over Gretchen Whitmer in the Democratic primary for governor, with Thanedar polling at 21 percent and Whitmer at 18 percent. That's a dramatic change from MRG's last poll in September, which put Whitmer ahead of Thanedar by 24 points. A February Epic-MRA poll had Whitmer leading Thanedar by 10 points. The latest poll also has former Detroit Health Department director Abdul El-Sayed in third at 10 percent, and Livonia businessman Bill Cobbs at 3 percent. Also a surprise is how grim Detroit looks for Whitmer. 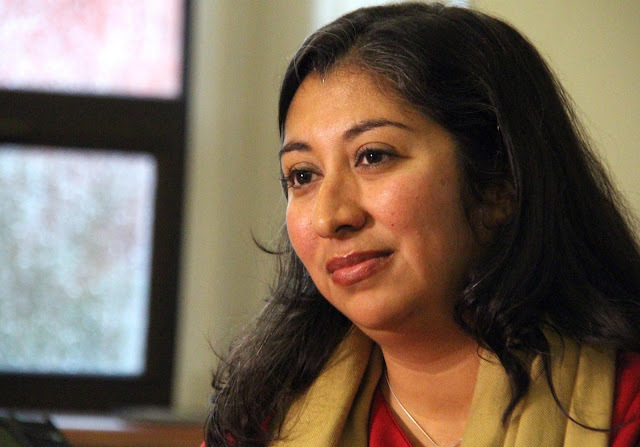 Despite an endorsement from Mayor Mike Duggan, she's polling at just 9 percent, is trailing Thanedar by 18 points, and is behind El-Sayed by five points. However, though the poll is good news for Thanedar and he has the highest name recognition among Democratic candidates at 45 percent, 48 percent of Democratic voters MRG surveyed are undecided." Gretchen Whitmer was supposed to win the primary pretty much hands down, but every day, things only look worse for the former Senate Minority Leader. Shri will only continue to pour money into his campaign coffers, and he is very likable, look at his hit Super Bowl ad introducing himself to voters and teaching them how to pronounce his name, for example. Whitmer is in trouble, big league. Mike Mitchell Arrested By FBI, WMP Vindicated: More Arrests Coming In Plymouth Township? WMP broke the story weeks ago: Mike Mitchell was facing imminent arrest after being busted with a garage full of Plymouth Township items, including a John Deere "gator" cart. The haters came out in full force: it's BS, fake news from Brandon Hall, they said. The circlederping was in full force! Whatever, go to hell. Of course, as usual, WMP's law enforcement sources were solid, and Mitchell was indeed arrested a week and a half ago. Every WMP story is backed with solid sources. "Mike Mitchell, former director of parks and grants in Plymouth Township, has been caught up in a federal corruption investigation. The Department of Justice, along with the FBI and township Police Chief Tom Tiderington, announced Wednesday a federal theft charge against Mitchell, 49, who now lives in Rockford, Ill.
Mitchell, whose township job was created shortly after Shannon Price was appointed township supervisor in 2015, is accused of taking a John Deere utility vehicle, a commercial lawn mower and other equipment that belonged to the township. The charge he faces is formally called theft from a government receiving federal assistance and is punishable by up to 10 years in prison and a fine of up to $250,000. “When public officials use their jobs to steal from taxpayers, their theft isn’t just measured in dollars — it is measured by the damage caused by robbing the public of honest government. We will stand up and fight this corruption at all levels,” U.S. Attorney Michael Schneider said in a justice department press release." Now the question is, what's next? Are more charges coming to Plymouth Township? "The federal charges filed last week against former Plymouth Township Director of Parks and Grants Mike Mitchell may be the first of several indictments as a result of an ongoing corruption investigation," according to the Plymouth Voice." 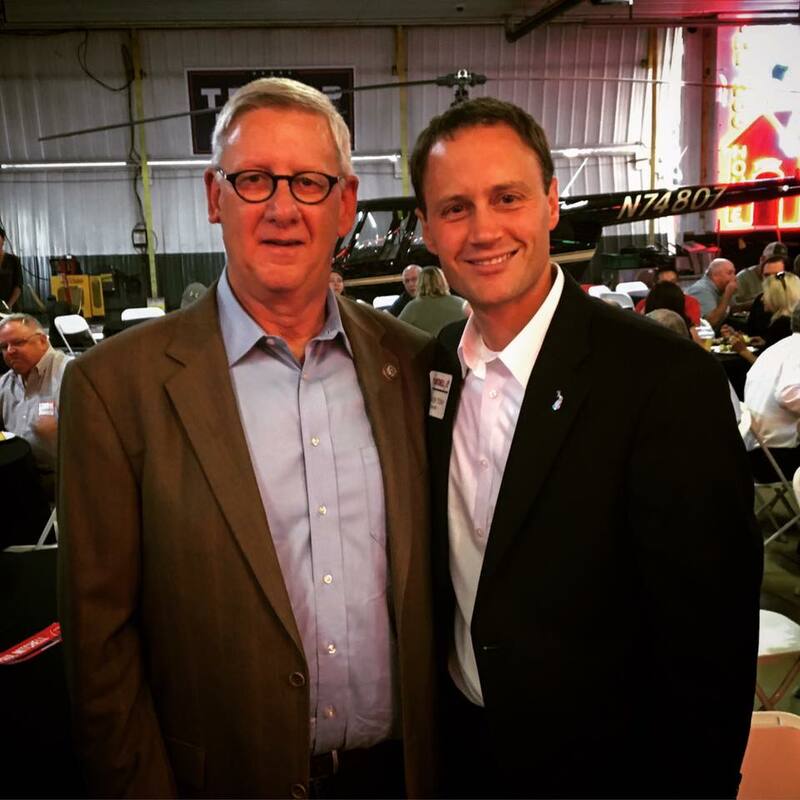 Congressman Paul Mitchell pulled no punches recently while addressing State Senator Tonya Schuitmaker's campaign tactics in the race for Attorney General, blasting Schuitmaker for targeting Tom Leonard's wife. Mitchell is endorsing Speaker Leonard, who he says he has known since 2012. Mitchell also spotlighted one of Schuitmaker's mailers to delegates, which many believe are misleading. Mitchell's comments concern a recent controversy involving Schuitmaker in which her campaign consultant attempted to target Leonard's wife, Jenell. Lan$ing Beef$ Up For 2018: Politician$ Have Already Held Over 600 Fundrai$er$ in 81 Day$! Seven fundraisers a day. That's the average amount of fundraisers Michigan legislators are holding every single day so far in 2018. If you are wondering why you haven't heard back from your legislator or never see them, it's a pretty good bet they have been busy attending one of these events. "Some days in Lansing, the fundraising begins before the lawmaking does. Take Wednesday, March 21, for example. The first state House committee began at 9 a.m. 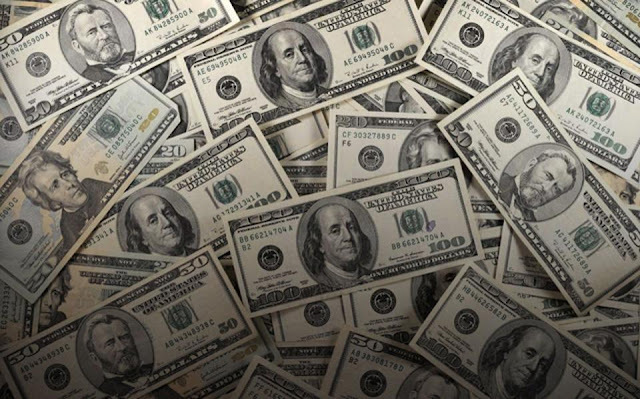 The first fundraiser was scheduled to begin at 7:30 a.m.
By 10 a.m. Wednesday, a (campaign) donor could have gone to fundraisers for five different state House members, according to invitations posted online. Inside a single office building, the Michigan Credit Union League was hosting a reception for Rep. Sue Allor, a Republican from Wolverine, on the fourth floor, and the Michigan Health & Hospital Association was hosting an event for Rep. Terry Sabo, a Democrat from Muskegon, on the 12th floor. 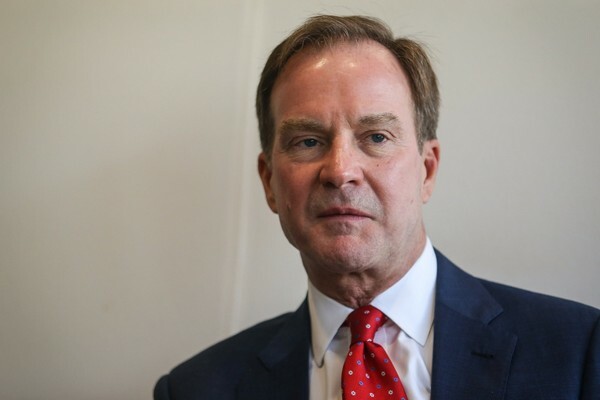 Attorney General Bill Schuette, a Republican from Midland who is running for governor, had the most fundraisers of elected state officholders in 2017, according to campaign finance disclosures. His attorney general committee and gubernatorial committee combined to report 38 fundraisers." MIRS is a Lansing based news outlet known to provide some of the best coverage of Michigan politics, and they recently put out their 2018 election guide. That's where things get good! 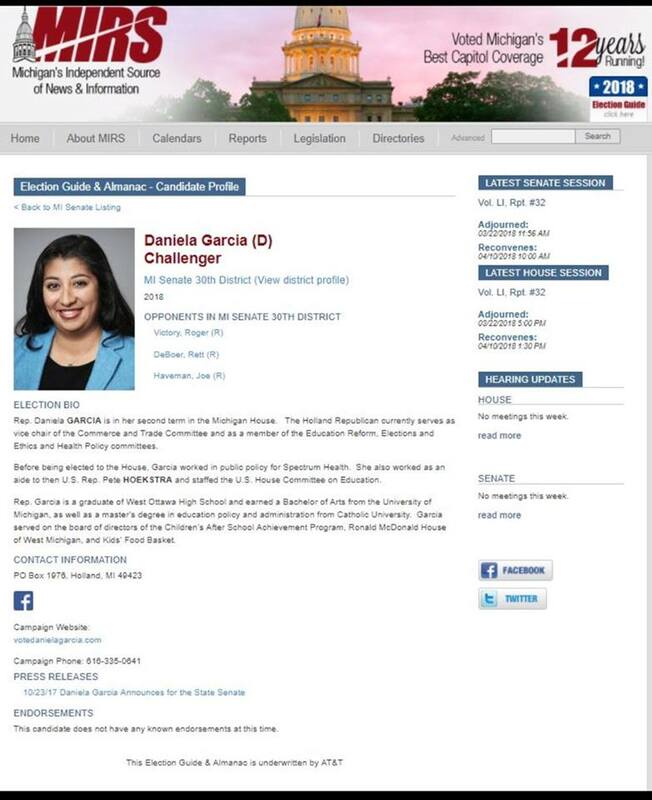 In the profile of #NeverTrump State Rep. (D)aniela Garcia, who is running for State Senate to replace Arlan Meekhof, Garcia was listed as a Democrat! The "error" is visible below, and was soon changed after the issue was raised. Garcia is one of the most liberal members of the House Republican caucus, frequently voting to raise taxes and opposing common sense conservative legislation. Garcia also claims Common Core is "a grassroots program." If you think Meekhof has been bad, you ain't seen nothin' yet! Garcia faces former State Rep. Joe Haveman, as well as State Rep. Roger Victory in the August primary. Speaker of the House Tom Leonard is normally pretty soft spoken, but Tuesday night, Leonard was furious, ready to knuckle up after learning his opponent in the Attorney General's race, State Senator Tonya Schuitmaker, was having a consultant prepare an attack on Leonard's wife, Jenell. In a Facebook statement shredding Schuitmaker, Leonard callied her actions desperate. "Desperate candidates sometimes resort to desperate actions – I get that. Unfortunately, that’s just politics. But after a couple weeks of hit pieces against me, she is now trying to go further and attack my family. That is unacceptable," Leonard said. "We recently found out her campaign consultant has requested personal information about my wife Jenell from her former place of work. I don’t know what Senator Schuitmaker is fishing for, but she is clearly looking for something to attack my wife for her own personal gain. This is wrong. This is above and beyond the desperate campaign mudslinging we all hate. My wife and daughter should be absolutely off-limits to personal attacks. If Senator Schuitmaker wants to take her campaign to the gutter, then she should keep focused on me. Leave my family out of it." Leonard pledged to run a clean campaign with no personal attacks on Schuitmaker's family. "You have my word – I am going to do all I can to keep my campaign focused on the issues that matter to you and not on the innocent families of my opponents," Leonard said. "I know the type of convention campaign I am going to run - honest, effective, well-organized, and strong. It will be a campaign I can be proud of - that my family would be proud of - and that you can be proud to support." Leonard says he is disappointed in Schuitmaker and urged the Senator to "cut it out." "I am so deeply disappointed in her, and I feel awful for Jenell," Leonard said. "Please know that no matter what my opponents do going forward, I am going to continue to talk about the issues that matter...Simply put, Tonya: cut it out. Our families are off limits." 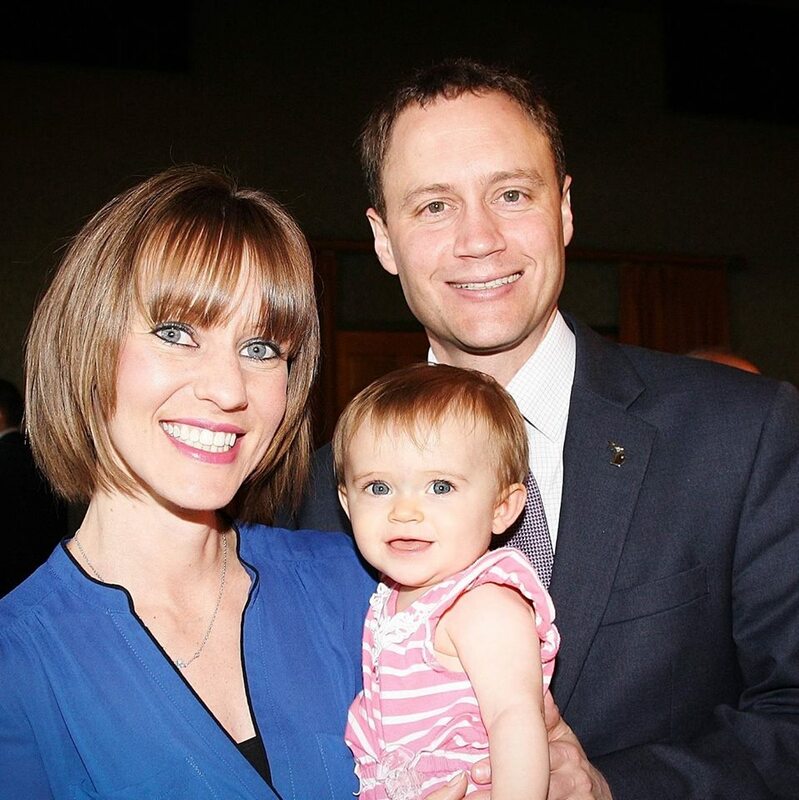 Grand Rapids based Republican activist Matt Hall will not run against Rep. Justin Amash, Hall announced Tuesday. Hall was running as a "Trump Republican," planning to highlight Amash's poor record of supporting President Trump. Instead, Hall had a change of heart after he realized he had more in common with Amash than the DC establishment swamp rats trying to remove him for his support of the Constitution. "Justin Amash and I have differences on immigration policy, the border wall, sanctuary cities, trade, and our nation’s military. But I have determined that my differences with the Washington interests seeking to oust Mr. Amash are greater," Hall said. "Because I would need these interests behind me in order to win this summer, and that is not the type of campaign I want to run, I will not challenge Justin Amash for Congress in 2018." Hall will remain active in the 2018 cycle, targeting Michigan legislators who have abandoned the conservative grassroots. "I will spend my summer battling Michigan “Republican” politicians who have strayed the most from conservative principles and President Trump’s agenda. These politicians have hindered progress on cutting taxes, protecting the Second Amendment, defending the right to life, blocking or repealing Obama Administration regulatory schemes, addressing unfunded municipal pension liabilities, lowering auto insurance rates, fixing our state’s education system, and establishing English as Michigan’s official language." Hall has not indicated whether he will seek a position in the legislature, though he is optimistic about GOP prospects in the fall. "Michigan Republicans are well positioned to win the November 2018 election across the board. We must take advantage of this historic opportunity by nominating conservatives who will support the Republican Party’s platform and embrace President Trump’s agenda." 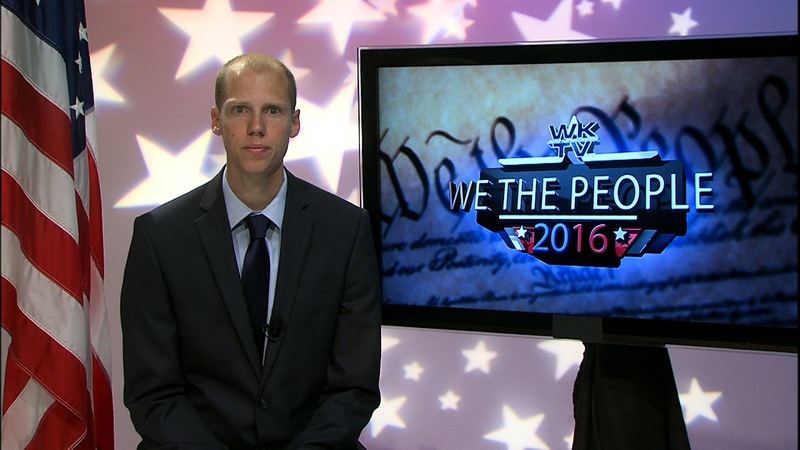 Hall, who recently became a lawyer, is a member of the Michigan Republican Party's State Committee. 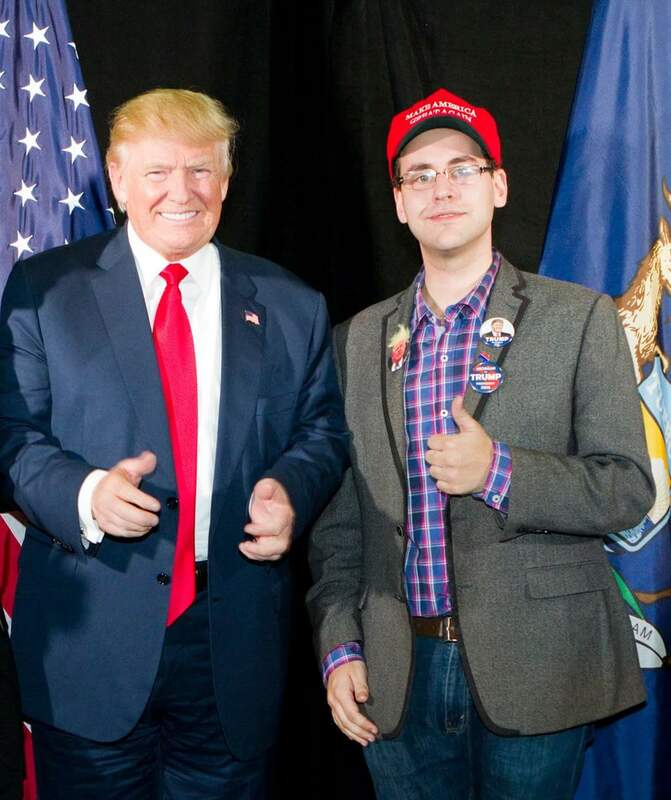 He was a strong supporter of President Trump's 2016 campaign in Michigan, serving as a delegate in Cleveland on the Rules Committee where he helped end the "Never Trump" movement, as well as the Trump 3rd District Chair in the fall.